GM studies indicate that plugged or restricted transmission oil coolers and pipescause insufficient transmission lubrication and elevated operating temperatures whichcan lead to premature transmission failure. Many repeat repair cases could have beenprevented by following published procedures for transmission oil cooler flushing andflow checking. 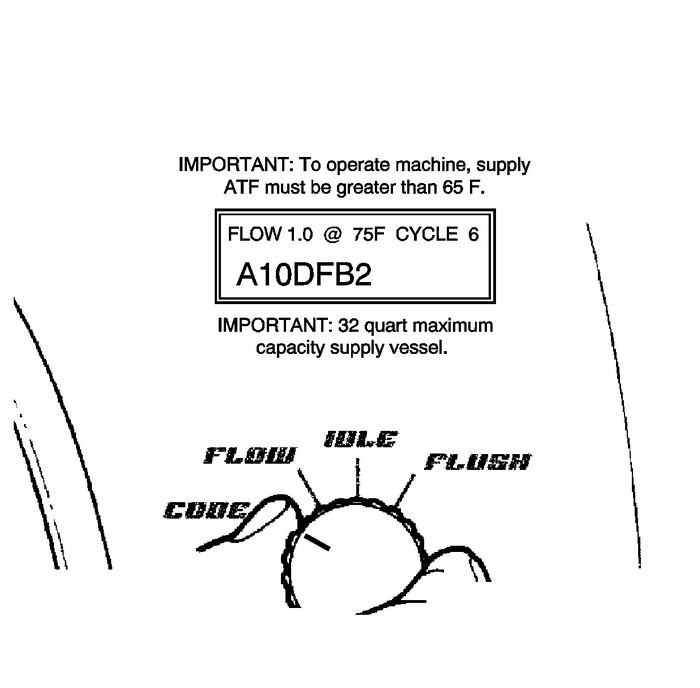 This procedure includes flow checking and flushing the auxiliary transmissionoil cooler,if equipped. Note:Use theDT-45096transmission oil cooling system flush and flow test toolor equivalent to flush and flow test the transmission oil cooler and the oil coolerpipes after the transaxle is removed for repairs. Only GM Goodwrench DEXRON®VI automatic transmission fluid should be used when doinga repair on a GM transmission. Verify that the main power switch-(1) is in the OFF position.Place the main function switch-(2) in the IDLE position. ConnectDT 45096flush and flow test toolto the vehicle 12V-DC power source by connecting the red battery clip to the positive,+, battery post on the vehicle and connect the negative lead to a known good chassisground.Turn the main power switch to the ON position. Caution:Do not overfill the supply vessel. Damage to the unit mayresult. To verify the fluid level, view the LCD screen displaywhile filling the unit, to ensure the fluid level does not exceed30-L (32-qt). 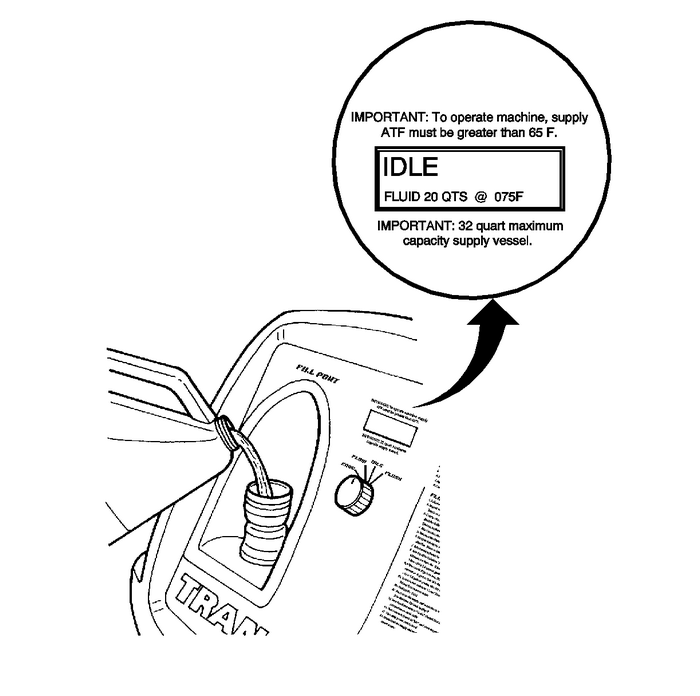 Fill the supply tank with Dexron®VI through the fill port.Reinstall and tighten the fill cap. 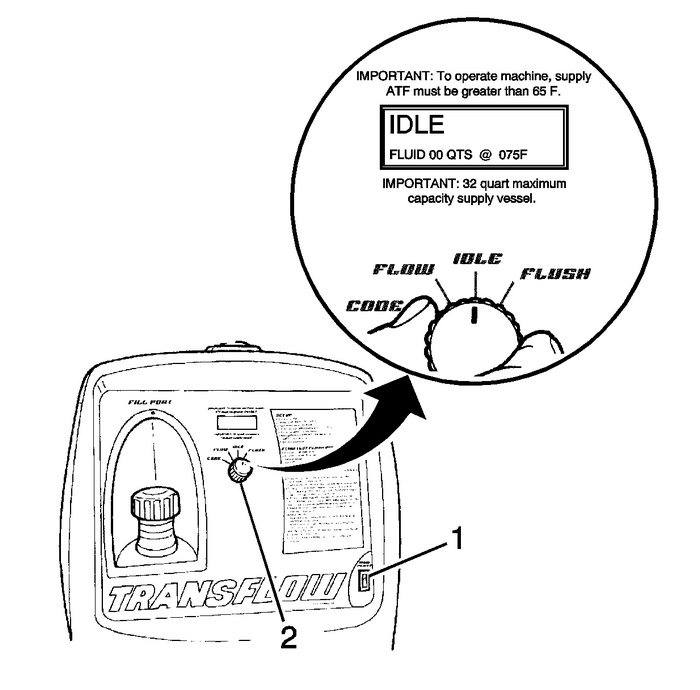 From the machine display, identify the temperature of the automatic transmission fluidthat is stored in the supply vessel ofDT 45096flush and flow test tool. 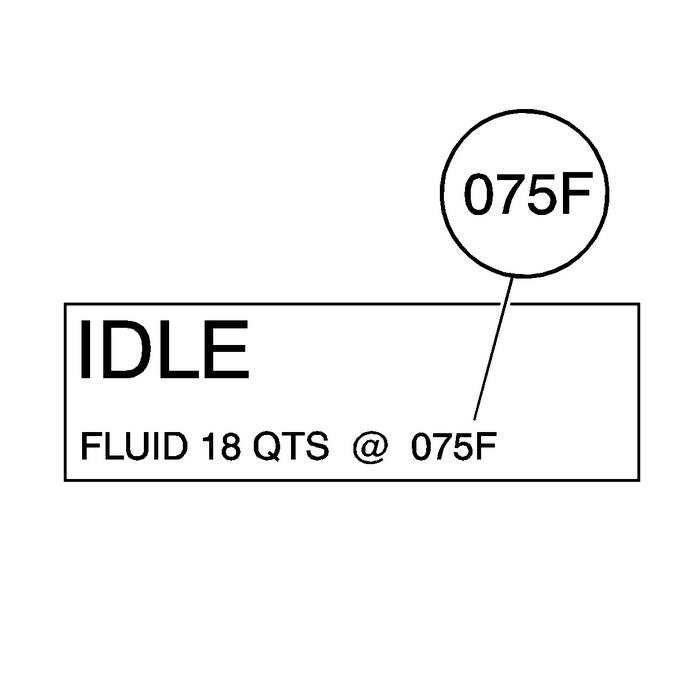 Determine whether the transmission oil cooler is steel or aluminum by using a magnet-(1)at the cooler flange-(2) at the radiator.Refer to the table below. Using the temperature from step-1, locate on either theSteel MINIMUM Flow Rate table or the Aluminum MINIMUM Flow Rate table the minimumflow rate in gallons per minutes (GPM). Record the minimum flow rate in GPMs and thesupply fluid temperature for further reference. The MINIMUM flow rate for this example would be 0.8-GPM. 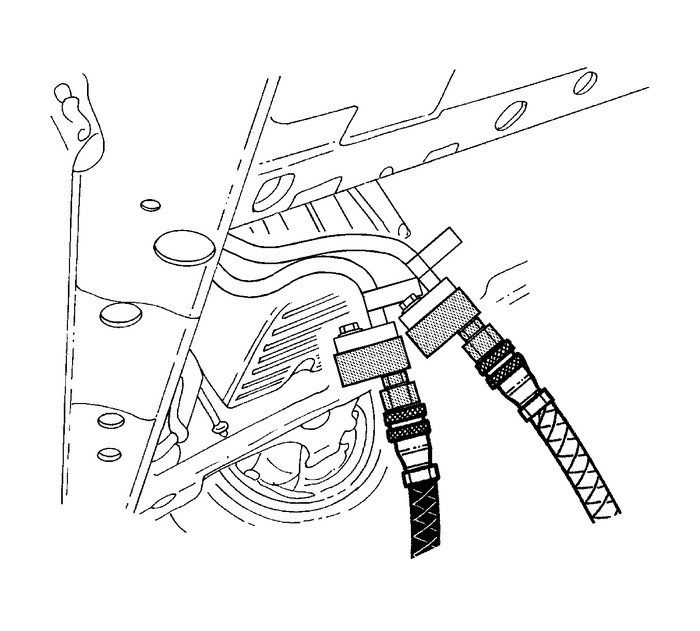 Inspect transmission oil cooler lines for damage or kinks that could cause restrictedoil flow. Repair as needed and refer to the appropriate GM service manual procedures. 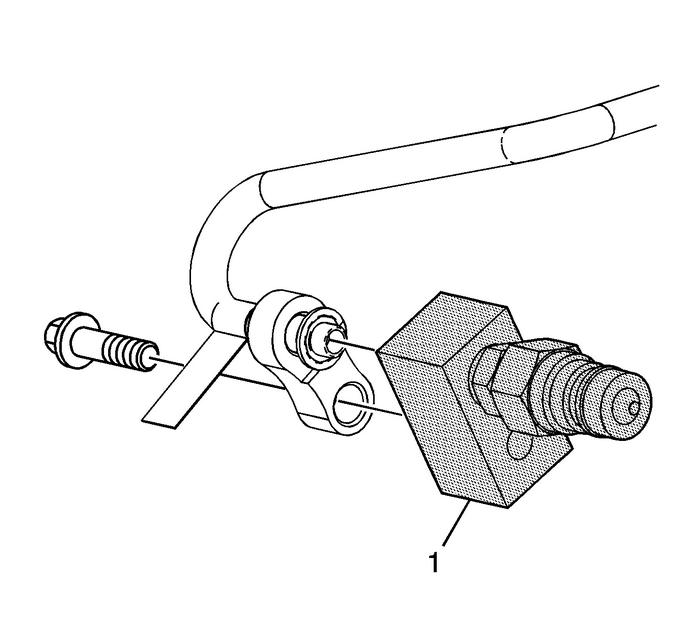 Connect theDT 45096-50cooler flush adapter-(1) to the vehicle transmission oil cooler supply and return lines at the transmission. 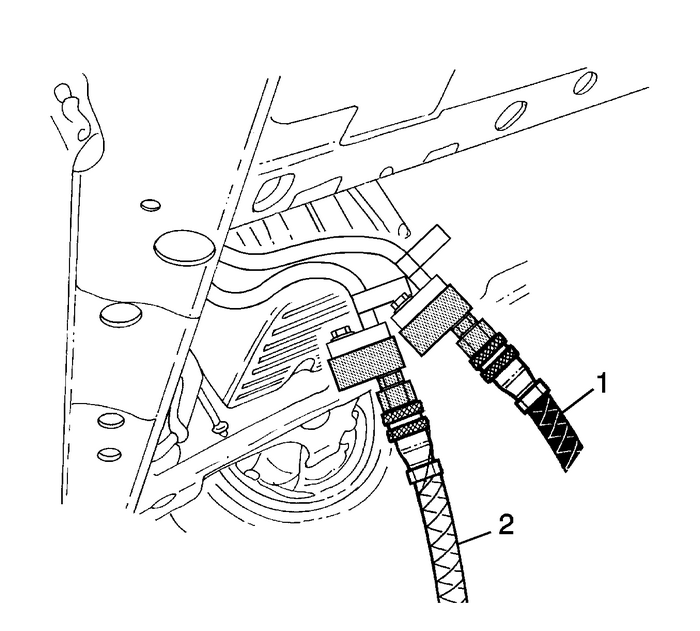 Connect the black supply hose-(1) to the return line, top connector of the transmission,and the clear waste hose-(2) to the feed line, bottom connector of the transmission,to the vehicle cooler lines. 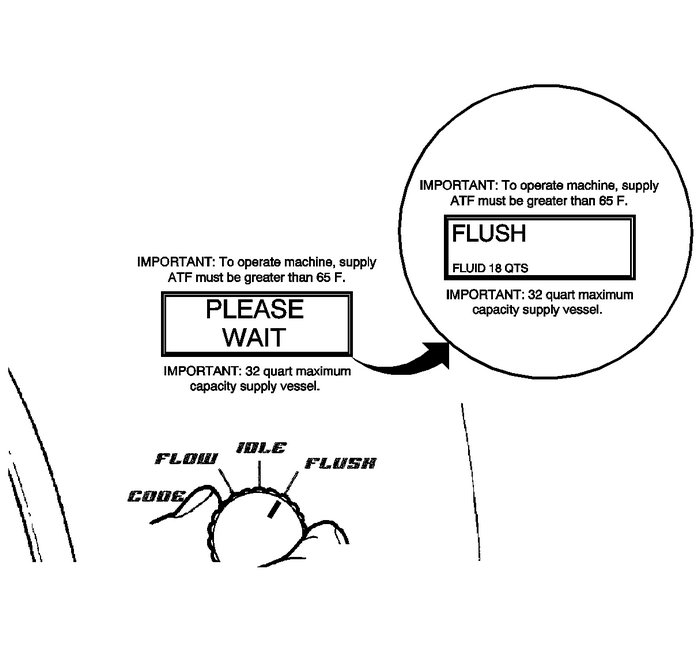 This is the reverse flow – backflush direction. 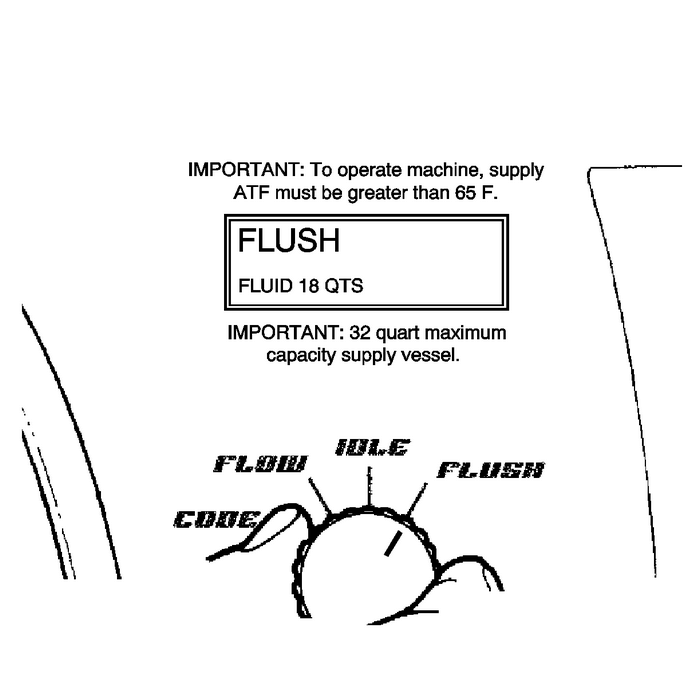 Turn the main function switch to the FLUSH position. Allow the machine to operatefor 30-seconds. 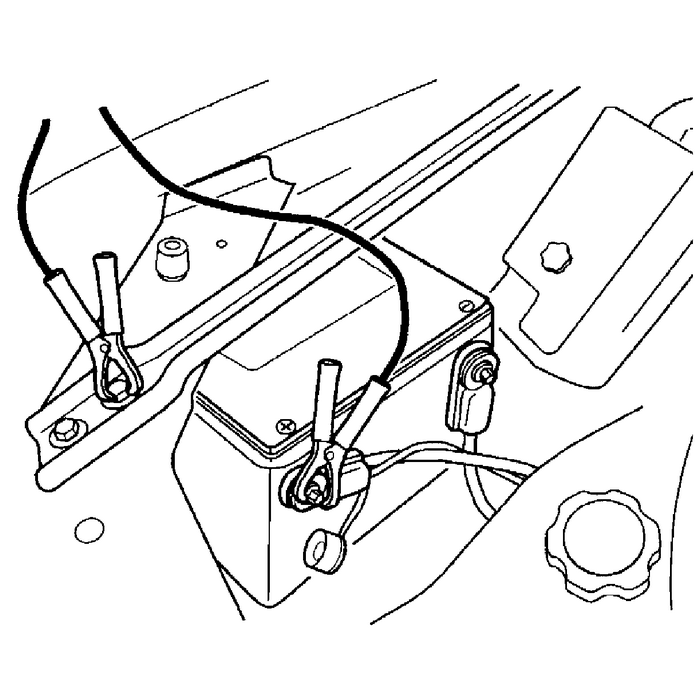 Disconnect the supply and waste hoses from the vehicle cooler lines. Reverse the supplyand waste hoses to provide a normal flow direction. 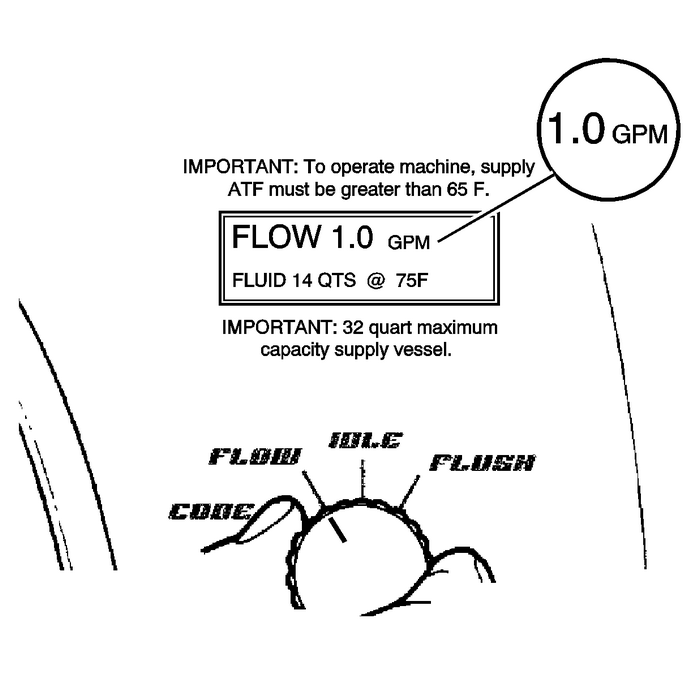 Note:If the flow rate is less than 0.5-gpm, the LCD displays an error message. 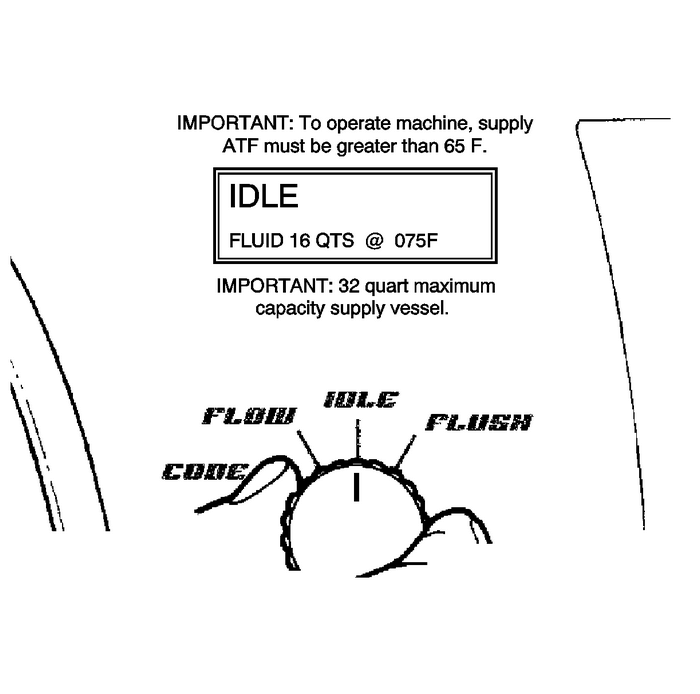 Refer tothe Troubleshooting section of the operation manual. Turn the main function switch to the CODE position. 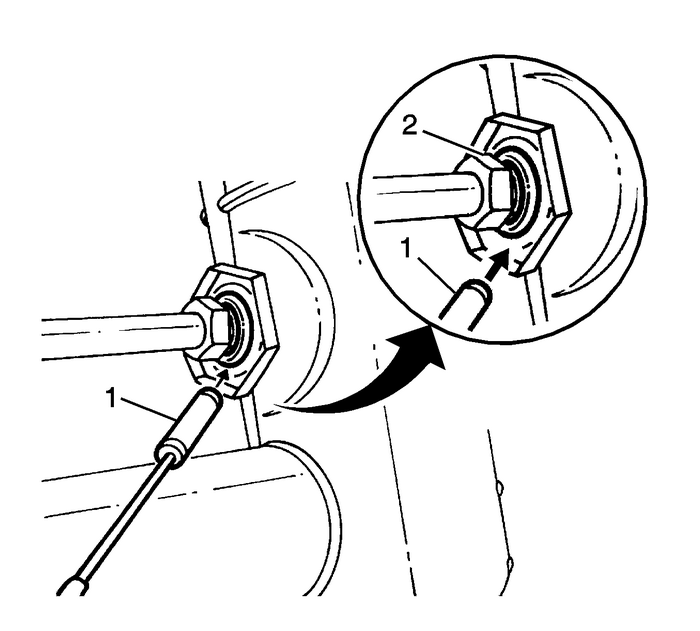 Turn the main function switch-(2) to the IDLE position and allow the supply vesselpressure to dissipate.Turn the main power switch-(1) to the OFF position. Note:A small amount of water may drain from the bottom of the unit when the air supplyis disconnected. This is a normal operation of the built-in water separator. 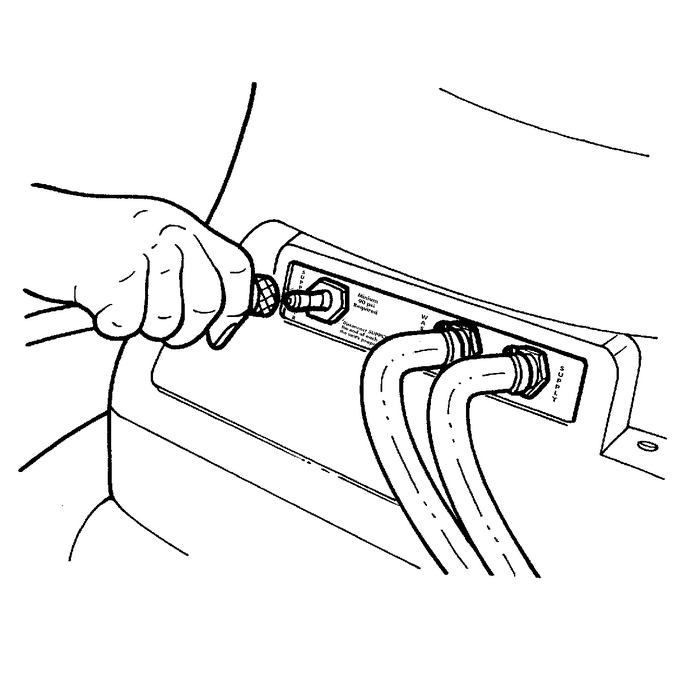 Disconnect the supply and waste hoses and the 12-volt power source from the vehicle. Disconnect the air supply hose fromDT 45096flush and flow test tool.Dispose of the waste ATF in accordance with all applicable federal, state, and localrequirements.